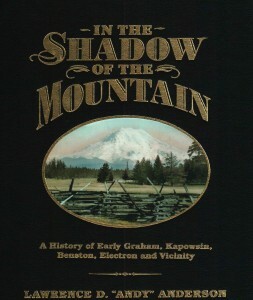 In the Shadow of the Mountain is written by local writer, Lawrence D. “Andy” Anderson. 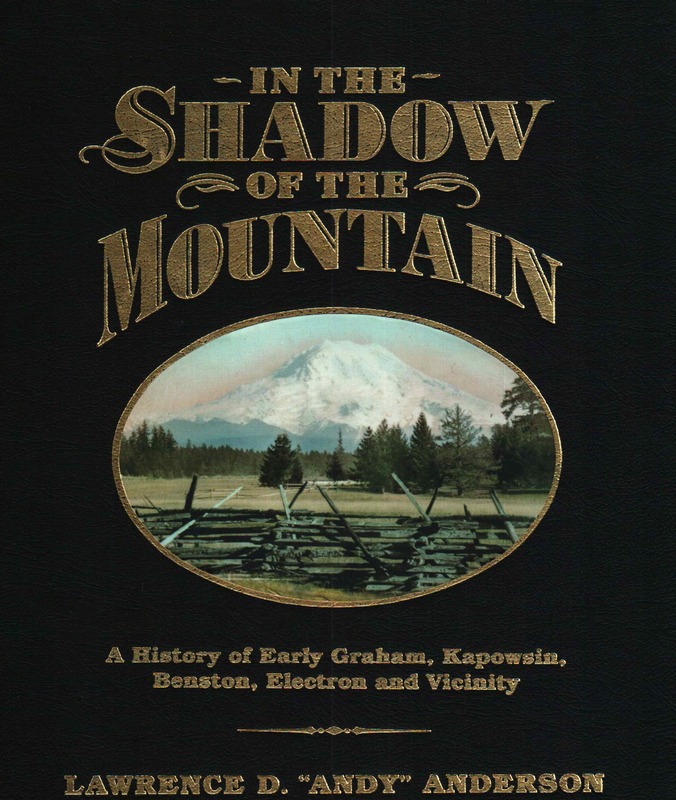 The book covers the history of early Graham, Kapowsin, Benston, Electron, as well as upper Ohop Valley and other spots in the vicinity. This wonderful 301-page book is as well researched as it is written. Lawrence is a retired manager of the Federal Aviation Administration and lives in Graham with his wife. He says history of the Graham and Kapowsin area has been his passion of his for over four decades. He collected a large amount of information from people in the area, as well as from books and records. And, as you might guess, the book is packed with photos. Although the book is currently out of print, you can check it out at the Eatonville Library and the Eatonville Historical Society has a copy as well. This has to be the definitive volume on the history of rural southeast Pierce County, from Puyallup to Eatonville. The author has done an enormous amount of research, conducted myriad interviews, and found wonderful vintage photographs. The lives of many pioneer families are given in fascinating detail. Overall, the material is attractively presented, suitable for teens as well as adults. Local kids looking for non-fiction reading matter would do well to choose this book. Serious historians will also be impressed at how thoroughly it is sourced. Author Anderson deserves the gratitude of all who care about this part of the country. Unfortunately, the book’s first printing has sold out, so you must go to the second-hand market or your local library. My fingers are crossed for a second printing. It is real quality. When will this wonder book of history be available in print again? Copies are scarce. I’ve held the book and would like to obtain a copy of it. Mr. Anderson: I implore you to go for another printing of your book. I live in Graham, though I am sure if Kapowsin Post Office delivered Mail, I’d be living in Kapowsin. I implore you to make one more printing of this phenomenal book. I’ve asked him as well! How can I get a copy of this great book! I know two people that would love copies!! It’s out of print, unfortunately. You can check on ebay or amazon. However, I think you can check it out at the Eatonville or Pierce County library. how do I get a copy? I am a friend of the McDonald family.All 10 of the boys and their father logged the Kapowsin tree farm. The youngest(Bill) is an avid collector of old logging equipment and gear and has shared many fascinating stories with me through the years! Would love to see the images and stories in this book! My friend Bill McDonald is the youngest of the 10 boys and worked in the logging camp (Kapowsin).He had many a position.From driving the crew bus to working on the log booms on the lake.When the camp finally shut down he was able to aquire some of the tools and gear that was left behind.He is a bonified collector of old logging tools and machinery and to this day still travels around locally taking part in exhibits at the tractor shows.His father worked in the camp when they were still using the crosscut saws to fell timber. He and one of his brothers also took part in the potential rescue effort of the dredge excavator that ,to this day,remains stuck and slowly sinking in one of the local pasture lands (the valley between Kapowsin and Ohop). You can see it from the road.Apparently the owner opted out of having it pulled out and decided to leave it there.I think its been there since around 1977.He still lives close to the lake today. Sorry not to respond sooner, but THANK YOU for this. Do you think he might be up for being interviewed? I know exactly what excavator you’re talking about. I drive by it all the time!! I left a comment below.Somehow it didn’t end up on a reply your last comment.I’ll call Bill today. Wow. I’ve been driving by that dredge for the last 20+ years without a clue as to where it came from or how long it had been there. I would love to know more about that! I have a extra copy in excellent condition for sale. I paid $100 for it. That’s what I would like to get for it. Hi, I apologize for not getting to you sooner. That sounds like a good offer. I’ll let people know you’ve got one for sale! Im sure he wouldn’t mind.His mother and one of his brothers were interviewed by Lawrence Anderson ‘In the Shadow of the Mountain’.He has many stories to tell any many a sought after pictures taken by one or more of his brothers during their time in the logging camps.He has quite a collection of the old saws and logging tools of yesteryear.I’ll call him tomorrow.How may I reach you? I had the pleasure of reading this book a couple years ago, but the owner would not part with it. I know at least 25 people who would prepay for a copy of the book if it was published again. It’s a great book! Thank you for your time! I’ve tried to get the author to reprint, but haven’t convinced him yet. I can’t figure out how to get in contact with the author, but if you know him will you please pass this on? My husband and I got an autographed copy from him years ago, and it is one of my most treasured books. Now my 12 year old daughter is learning from it as well, and will be using it in research for her state report on WA. Nothing beats getting to share history of right where you live. I know that he is part of the Graham Historical Society. I would try reaching him there first.